You never need a reason to make blueberry pancakes, especially as much as I crave pancakes with this pregnancy. 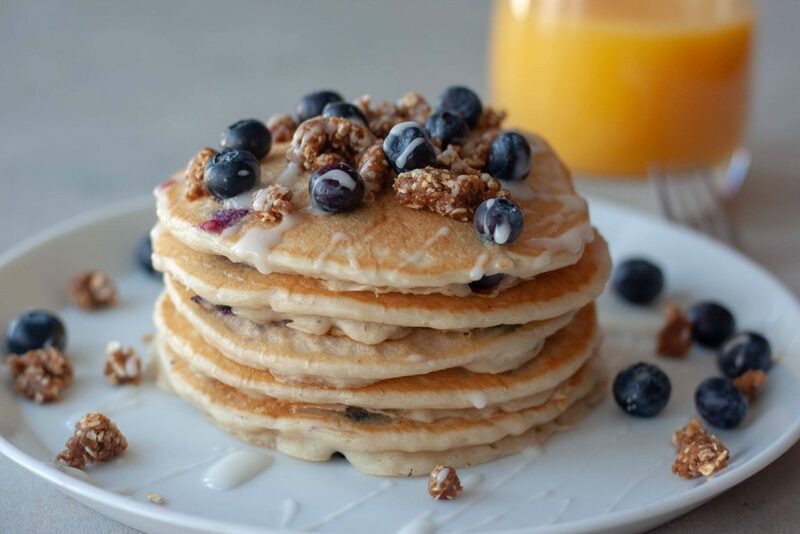 Today is National Blueberry Pancake Day and that means even more reason to enjoy a fluffy stack bursting with blueberries! 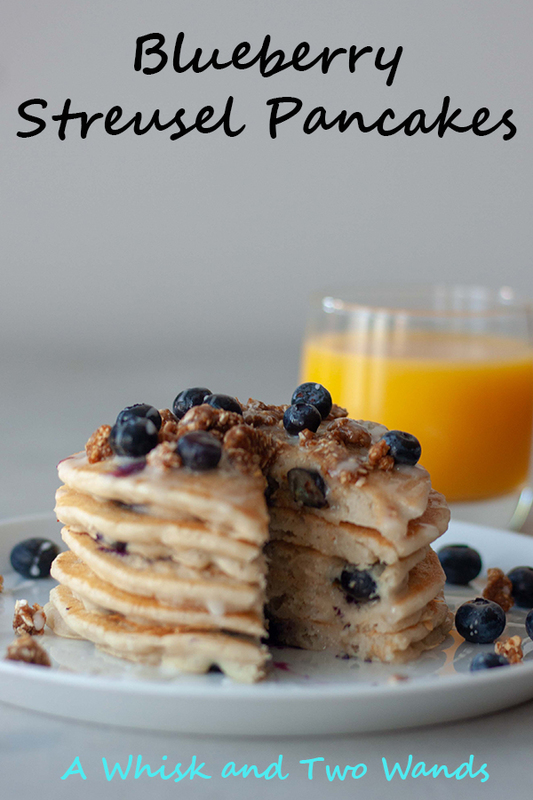 I decided to do something a little “fancy” and go with a stack of Blueberry Streusel Pancakes, a fluffy stack that’s with a hint of everything you love from a blueberry muffin. When it came to making these pancakes I knew exactly which pancake recipe I had to adapt. Years ago I made Strawberry Shortcake Pancakes, so light and fluffy almost like angel food cake on the inside they would be perfect. They don’t puff up quite as much with big fresh blueberries but sprinkling with smaller wild blueberries they will. Only this time of year the only way to make them that way is frozen which I’ll be doing today. The blueberries can bleed into the pancakes so if you’re going for photogenic fyi but for taste it’s the way to go, trust me you’ll enjoy every bite. I did attempt to bake the streusel crumble topping before and then sprinkle pancakes with it but it didn’t want to hold up well unless it was like granola which wasn’t what I was going for. I finally tried it with it unbaked and it was perfect as it holds the texture yet the butter melts on the warm pancakes and the ground up oats don’t add crunch but just a little texture. It’s cold here, sub zero temps, so if National Blueberry Pancake Day was on a weekend I’d most likely make a pancake version of these Wild Rice Blueberry Waffles. Cozy and a little heartier but again you can’t go wrong with a stack of pancakes, especially blueberry, if you ask me. In other news if you follow me on Instagram I might have to start taking it easy and prepare for Baby Boy a little sooner than planned. I was on rest all weekend but hoping it is temporary as I’m not ready for him to arrive and he needs to bake a little longer until he is officially full term. I’m hoping to get all the recipes on my list photographed and ready to go so I have one new recipe a week posting when he arrives and for a few weeks after. Things don’t always go as planned but we will see. I didn’t want to plan too far ahead though as I was hoping to keep things “real time and real life” and post what I’m eating right after he’s born. I figure it is part of adjusting and adapting and wanted to share how I was eating and fueling life as a mom. Not that I’m not a mom but it will be different and interesting to see what our meals and daily eats look like as a busy family with 3 kids newborn to a teen. For a few weeks my husband will be home so he can be the sourdough bread maker for awhile. So many people already have said you have a teenager that can help with the cook. Well in all honesty A who is 10 is better (and enjoys) in the kitchen than S at 15. Both have been in the kitchen with me since day one but with S things changed over the 15 years as I was diagnosed with Celiac during that time, vegan for a few years, and things were always changing. While some would think this would make her more knowledgeable in the kitchen she just hasn’t had the desire to cook much in the last couple years. Don’t worry though we won’t starve because A can cook some and she makes a mean stack of pancakes. I think I could live off pancakes if I had to! 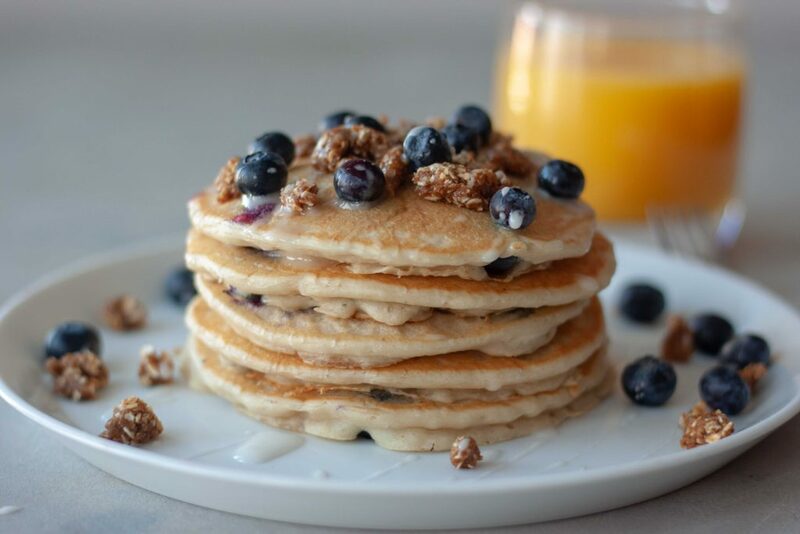 It’s Meatless Monday and if you didn’t get your blueberry pancakes for breakfast Blueberry Streusel Pancakes would make a perfect brinner! 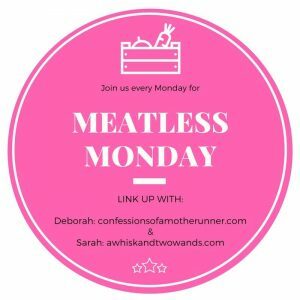 Not a brinner fan check out one of the recipes linked up below for our Meatless Monday link up. Deborah and I always look forward to seeing all of your exciting recipes and hope you join us. 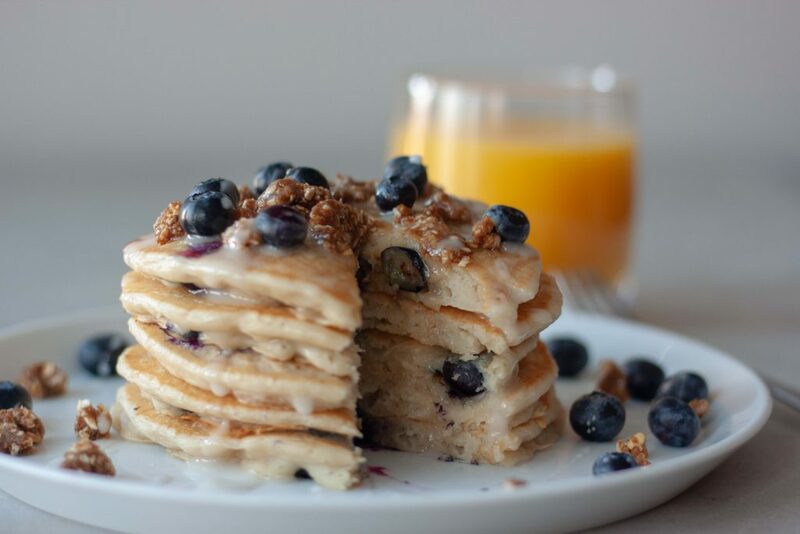 Fluffy stack of pancakes bursting with blueberries with a hint of everything you love from a blueberry streusel muffin including the crumble topping and icing. A stack is sure to sweeten up any morning! In a small food processor pulse together ingredients for the crumble topping. In a bowl mix together flour, sugar, baking powder, and salt. With a pastry cutter or two knives cut in coconut oil until you have a course crumbly mixture, there should be no large chunks of coconut oil. Add vanilla and almond extracts to your milk and slowly add milk to the flour mixture and whisk until smooth, there may be some small lumps. The batter will thicken as it sits. Alternatively you can freeze the coconut oil and make them using a Vitamix, or powerful blender. Just make sure the coconut oil is solid or freeze it for a bit or they won't be as fluffy. Heat a non stick griddle to medium- high and let heat up. Spoon mixture onto your griddle, sprinkle with blueberries, and cook until the edges are starting to look dry and set and bubbles are starting to hold in the center of the pancakes, flip and continue cooking until golden brown. Using a metal spatula works best and pancakes should release when they are ready. Plate pancakes and top with crumble topping, extra blueberries, and a drizzle of icing. 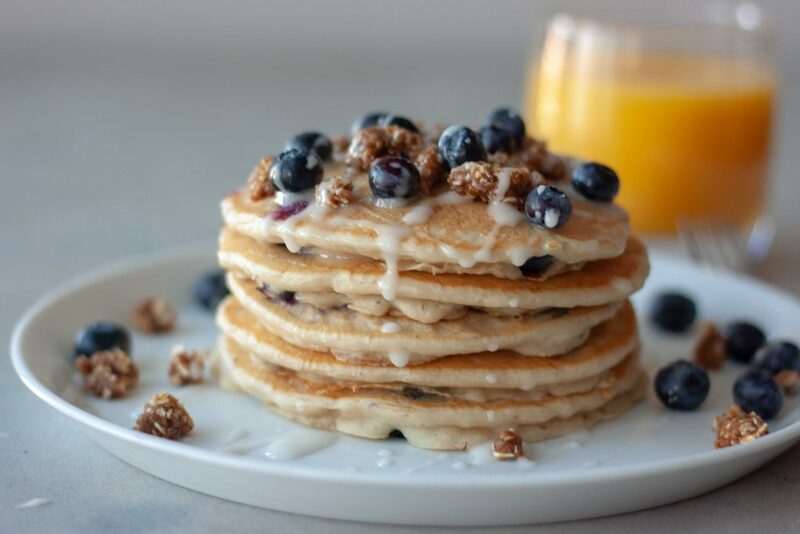 *You can use frozen blueberries but try to keep them frozen to prevent them bleeding into the pancakes if you're looking for blueberry studded photogenic pancakes. The pancakes will not get fluffy and will not puff up if you use wheat flour or a heavy flour. For best results use a 1:1 gluten free baking flour or regular white flour can be used. Thank you, the sub zero temps and everything being closed has made it a lot easier to not do anything and relax aka be lazy. I hope your rest time goes well and that little boy waits some time before he decides to make his entrance! These pancakes look scrumptious! I rarely take the time to make pancakes but now I feel inspired! Thank you Debbie, things have calmed down a little this week and I’ve been able to rest. The polar vortex and everything being closed has helped. Happy to have inspired you, I hope you enjoy a fluffy stack soon! 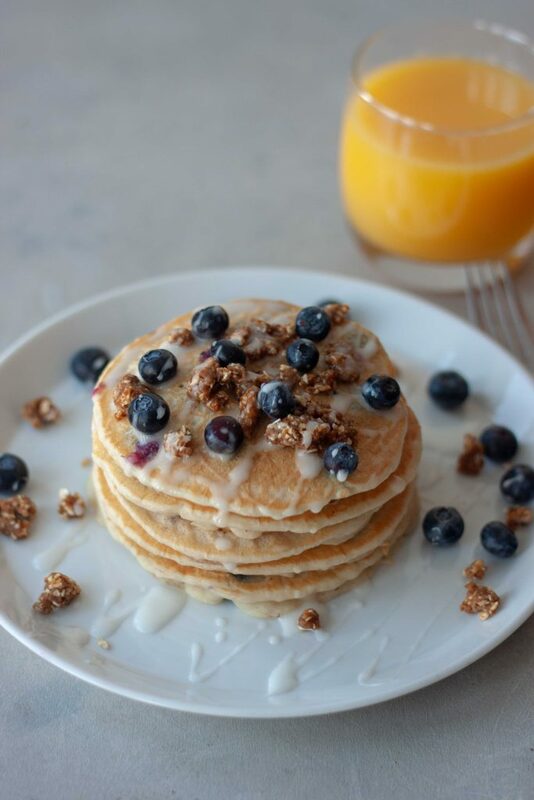 Blueberries, Streusel, and pancakes! Yum x3! YES!! 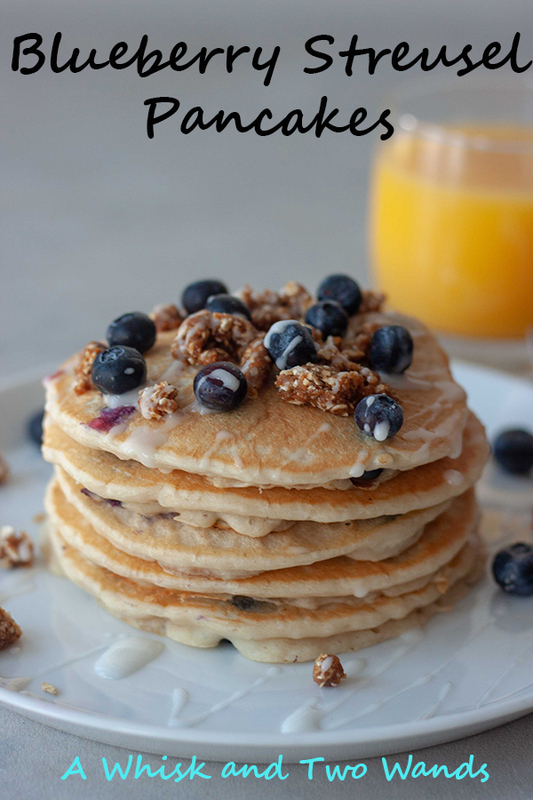 I love blueberry pancakes and these will be made very . soon. Love that they are Vegan.